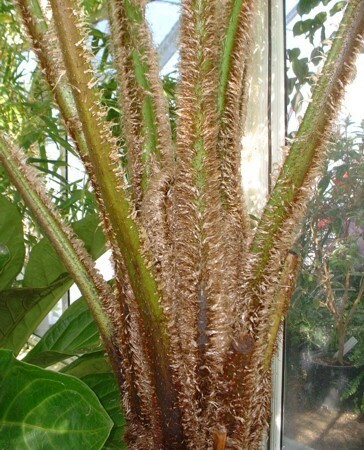 This is probably the second most common treefern in cultivation after Dicksonia antarctica. It is well-known over much of the world and not difficult to find in areas where it is well adapted. Its popularity is probably a result of its great ease of growth and tolerance of neglect. It hails from eastern Australia, but does not grow at nearly such high elevations as Cyathea australis and Dicksonia antarctica do. 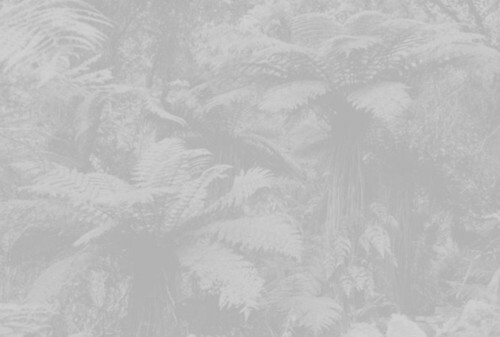 The first common name is the one Americans have given it, without regard to the fact that there is a great number of treefern species from Australia. "Lacy treefern" is the Australian name, which refers to the texture of the fronds compared to Cyathea australis ("Rough treefern"). Not surprisingly, some variation occurs within this species, and as a result several named forms such as 'Brentwood', 'Emerald Beauty' and 'Kalgoorie Gold' are in cultivation. 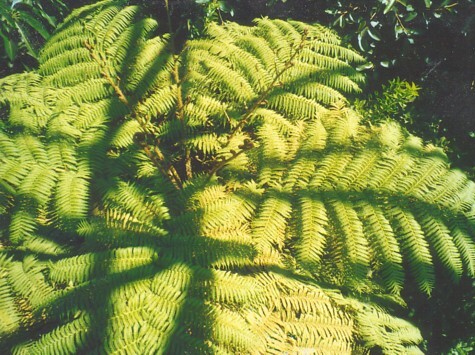 In cultivation this species is often confused with Cyathea australis. If in doubt, it's probably C. cooperi, because there are far fewer C. australis in cultivation. The two are easily distinguished: C. cooperi, in most cases, has white and brown scales on the stipes (see photo), while C. australis has only the brown ones (see photo). C. australis also has spines at the bases of the stipes, and C. cooperi has a much more fleshy stipe than C. australis. There are also differences in their reproductive structures. 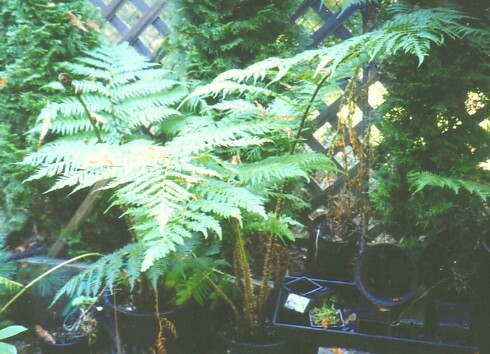 The most important difference to many fern entusiasts is that C. australis is far more cold-hardy. 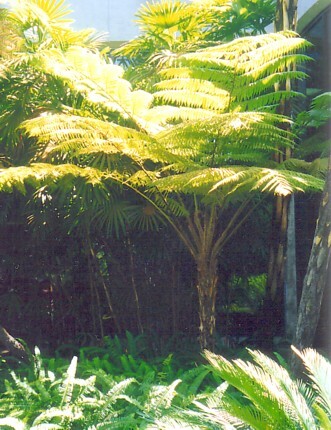 Cyathea cooperi has a slender trunk usually about 3 - 6" thick, sometimes growing to 30' high, and puts on growth very quickly. 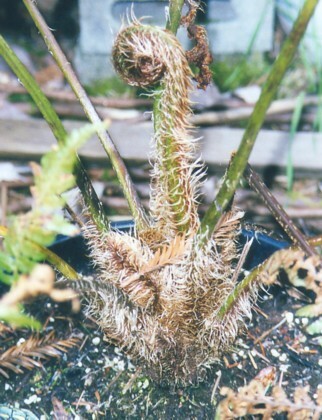 The fronds typically will reach about 8' long on a mature specimen, but, as with most tree ferns, they will be significantly stunted if kept in a pot. It will grow well in dappled (but not deep) shade, but also does well in some sun, even in hot climates, as long as the moisture supply is adequate. It also does relatively well in exposed, windy situations. These features make it a splendid treefern for a wide variety of sites. 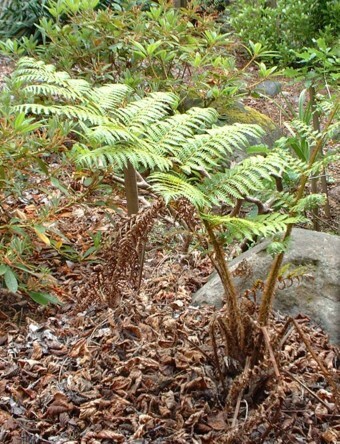 Although Cyathea cooperi has been overwintered successfully in England and other cool climates, I do not generally tend to recommend it to gardeners in such locations unless they really want it for their collection, or it is the only species they can get hold of. It is not particularly cold-hardy; and the fronds will usually burn at about 27°F or so. Complete mortality generally occurs below 22°F, though some have recovered. It is, in fact, the least hardy species of Cyathea to which I have given a sub-page of its own (and I've done this only because it is such a well-known species). My reasoning is that if you are willing to go to the trouble of overwintering such a cold-tender treefern in a zone 8 or 9a climate, some equally hardy yet far more spectacular species such as C. brownii, C. howeana, and C. robusta are more worth your effort. C. cooperi grows very easily from spore. 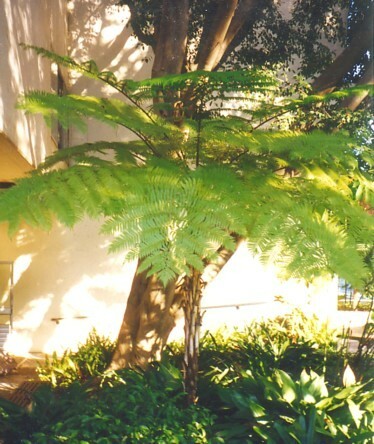 A slender-trunked Cyathea cooperi at San Diego State University, California. Photo by the author. 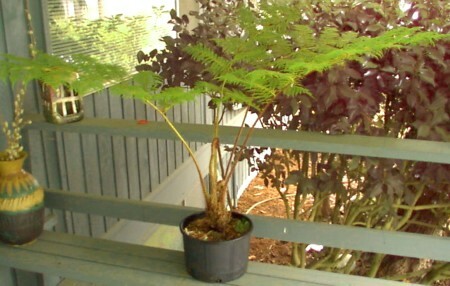 A potted juvenile Cyathea cooperi. Photo courtesy of Sam Castro. 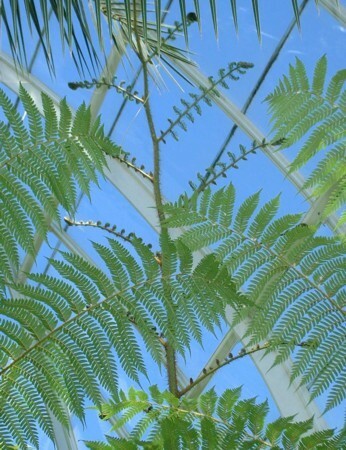 Looking down on the crown of Cyathea cooperi in a glass atrium (hence the shadows). Photo by the author. 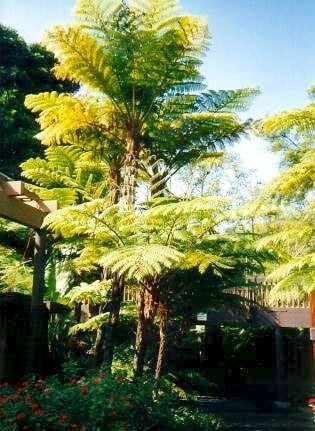 Cyathea cooperi in Los Angeles, California. Photo by the author. Impressive group of Cyathea cooperi in San Diego. Photo courtesy of Jeff St.Gelais. 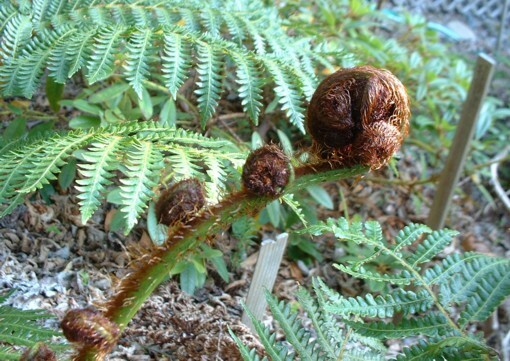 Young plants of Cyathea cooperi in my Olympia garden. The fronds are a deeper green from our cool Pacific Northwest Shade. Photo by the author. Cyathea cooperi, showing typical white and brown hairs on young croziers. Photo by the author. 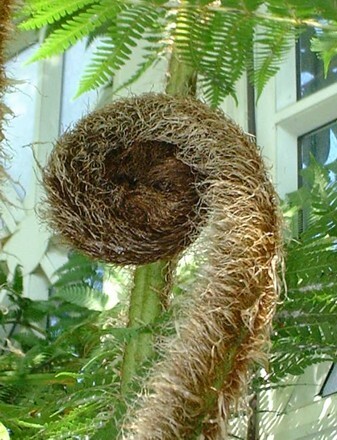 The uncurling crozier of a slightly older Cyathea cooperi. Crown of mature Cyathea cooperi, Volunteer Park Conservatory, Seattle, WA. Photo by the author. Crozier of a mature Cyathea cooperi, Volunteer Park Conservatory, Seattle, WA. Photo by the author. Fronds of Cyathea cooperi, making very "luxuriant" growth in the protected environment of the Volunteer Park Conservatory, Seattle, WA. Photo by the author. 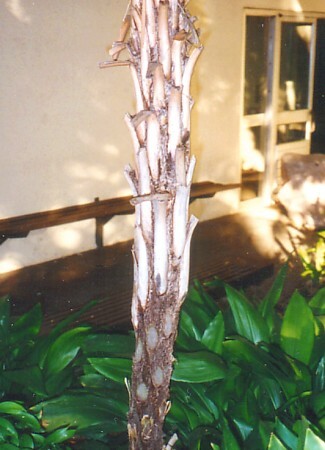 Trunk of Cyathea cooperi at San Diego State University, California. Photo by the author. 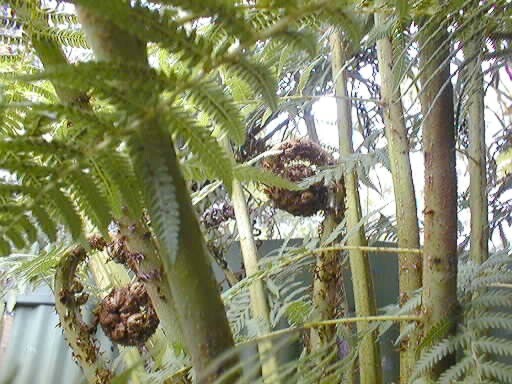 Cyathea cooperi in early June in my Olympia garden. I overwintered this fern by dumping a huge pile of leaves over it--a technique that will be less and less practical the bigger the fern gets. Photo by the author.